According to me this is a very healthy dish which is easy to make and adjusts itself according to the side dish it is served with. Even a mixed vegetable curry made in a spicy way will be a great combo with this. Bring 8 cups water and salt to boil and add the broken rice to it and let it cook till the rice is very soft. If you feel the rice consistency is tight then add some extra water to make it nice and soft. Once cooked spread (don't mix) the ragi powder on the top of the cooked rice, simmer and cook covered for 10 mins. Remove from heat and stir and mix it fast so that the ragi powder gets mixed well with the rice. Make sure your fast so the ragi powder doesn't lump up. 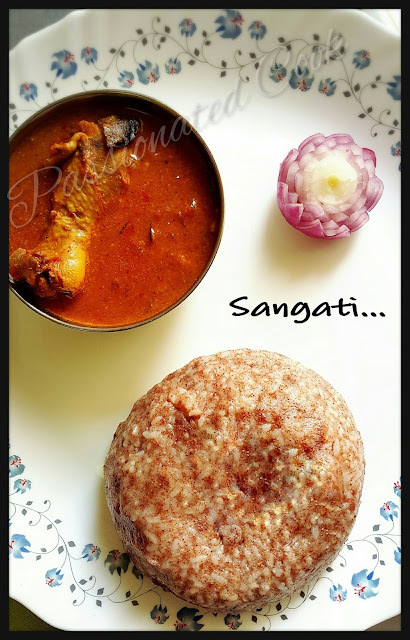 Serve directly into the plate with some spicy curry or you can add a cup of the sangati to a wet bowl and swirl it around so it forms into a beautiful ball. I served with some spicy chicken Kurma.